WASHINGTON, Feb. 1— Construction employment expanded by 52,000 net new jobs in January, according to an Associated Builders and Contractors analysis of data released today by the U.S. Bureau of Labor Statistics. Industry employment is up by 338,000 net jobs on a yearly basis, which represents an increase of 4.7 percent. 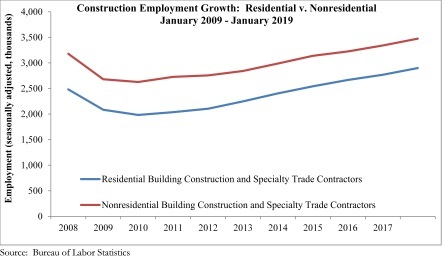 Nonresidential construction employment grew by 28,600 net new positions on a monthly basis, although the nonresidential building sub-sector lost 800 net positions.